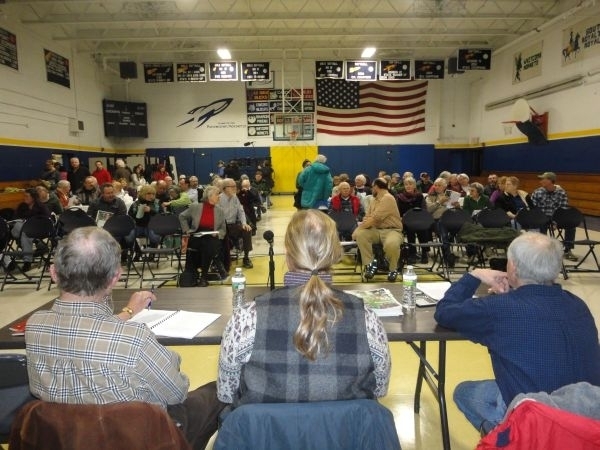 Tuesday was Town Meeting Day around the state and we heard about Senator Bill Doyle’s annual survey and proposals for new fire departments, rescinding corporate personhood, new town halls and rebuilding after Tropical Storm Irene. (Bob O’Donnell, Pomfret Town Moderator) "Hear Ye, Hear Ye, Hear Ye. The legal voters of the Town of Pomfret are hearby warned and notified. To meet in this town hall on this Tuesday, the 6th day of March in the year of our Lord, 2012." (Washington County Senator Bill Doyle) "Constituents naturally want to be involved in the political process. This is one way you can express your opinion… and I think the legislators themselves want to know, over 100 legislators will be taking these surveys out to their own constituents." (Grand Isle Fire Chief Bill Baron) "For example, in the old station when a engine starts, the exhaust fumes stay in the station. The new station has an exhaust extraction system that’s designed to remove the diesel fumes from the building so firefighters aren’t exposed to that." (Cari Burkhard of Rochester) "This is wrong. A corporation is not a person. People are people. And that’s it." (Castelton resident Matilde Turok) "I feel that moving away form the historic building in town is like cutting the heart out of the town." (Hartford selectboard member FX Flinn) "One of the most important ones will be to see to it that the bridge project really gets off to a good start and that we really keep the pedal to the metal, as it were, to make sure that we get that bridge up and running before winter comes late this year." (Tinmouth resident Deb Thompson) "Town Meeting is pure democracy. It’s participatory democracy. And the founders didn’t come up with this format because it was convenient."